There is a Buddhist figure known as Kshitigarbha Bodhisattva. His special vow is to save all the beings in the hells of the six worlds ("gods," "angels," humans, animals, hungry ghosts, hell-beings). You'll also see six statues standing at crossroads. I was very familiar with the figure, but didn't really understand the whole "six worlds" thing until I studied Buddhism back in the states. Aren't they cute, with the hats and all? They, and the many, many figures standing behind them, represent aborted babies. It's not my intention to get into a right-to-life debate. Rather, I want to point out that the economic realities in Japan for years made having children prohibitively expensive. Many families turned to abortion, but it was never a happy choice. 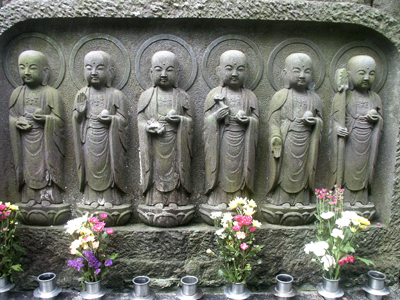 Seizing on a "golden opportunity" (like most clergy anywhere), the temples began offering a way to appease these "water babies" (mizuko, the departed spirits of the aborted babies). 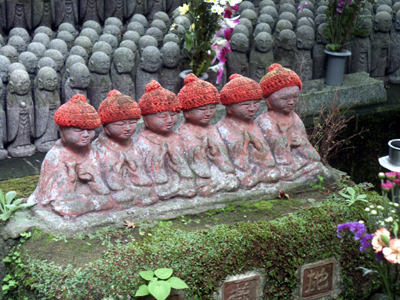 For a price, you could buy a statue of Jizo (Chinese Di Zang), patron of the dead, and dedicate it to your baby's spirit. I have been in places where the hills are covered with such "offerings." Close in, as below, you can see that some families still "care" for the baby on certain anniversaries by dressing the statue. 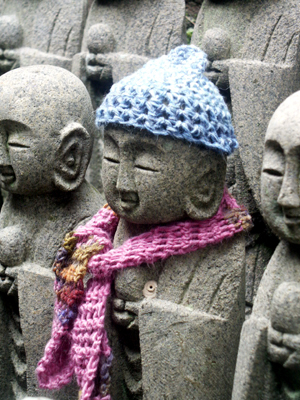 I have seen toys and food offered at nearby shrines for this purpose, as well. A sad practice, but if it brings some solace, can it be all bad?